At Kennels Cottage you just might have found the perfect solution for that elusive 50th birthday gift, our Mini Tour of Scotland Package. Our Package includes, 2 nights four star accommodation, 2 days classic car hire in your chosen classic car, route planners and maps for each days touring. We can also organise taxi transfers (at preferential rates) to and from Glasgow and Edinburgh airports or local train stations, we can make dinner reservations on your behalf in fact all you have to do is get here. The Mini Tour of Scotland can also be purchased as gift voucher which is valid for one year. You can also shorten or lengthen the package to suit your requirements. 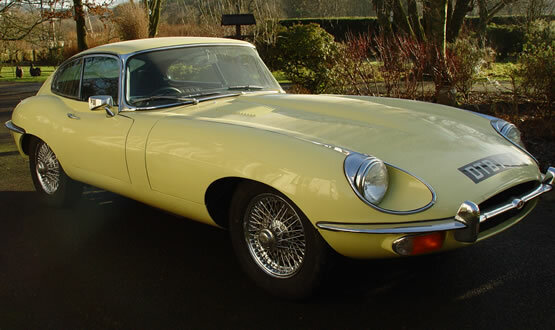 As a child of the 1960’s our fleet of classic cars will evoke memories of a lifestyle and times you got a glimpse of. Remember the glamorous movie and pop stars driving round in their E-Type Jags? Remember the growl of a triumph or MGB Roadster as it roared down the road on its ways to somewhere exciting, scarves trailing in the wind? This is your chance to step back in time to the golden bygone days of the swinging sixties, open top driving, carefree days, and the gleam of chrome on a stylish car. Watch people look, smile and wave as you drive by in something quite unique. Our cars always make great talking points, they make friends easily. Scotland is the perfect place to really get the best out of a classic driving experience, turn the key, put your foot down and look out for some of the most spectacular scenery Britain has to offer. Caledonian Classics fleet of eight classic cars gives you plenty of choice, E-Type Jaguar, MKII Jaguar, Healey 3000, Triumph TR6, Morgan 4/4, MGB Roadster, Porsche 912, or Convertible Beetle. Scotland is the ideal country for driving a classic car, open roads, amazing countryside, and no traffic jams. The most stress free time you will have spent in ages! We are easy to get to 40 minutes away from Edinburgh Airport, 1 hr away from Glasgow Airport. We can organise taxi transfers at preferential rates and organise dinner reservations. All you need to do is arrive and we’ll do the rest. Includes 2 days car hire for 2 drivers and 2 nights accommodation, based on 2 people sharing. Visit our classic car web site for more information.